Wade Radtke has been an Aiken County resident over 18 years. He graduated from USC Aiken with a major in Business and Finance. While at USC Aiken, Wade was a member of the golf team earning Academic All-American honors. 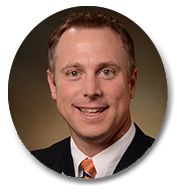 Wade has been in the mortgage industry for over 16 years, 12 of those being employed with SRP Federal Credit Union. He is a member of the Aiken Chamber of Commerce and Aiken Board of Realtors. While at SRP, Wade has been recognized as one of the top producing mortgage loan originators. Wade is a recipient of the Mortgage Bankers Association of Georgia's Gold Award twice and Platinum Award four times for his accomplishments. These awards recognize mortgage loan officers that demonstrate the highest standards of education, ethics and production in the mortgage industry.